Gigi has found the rhythm of her Viajante, in Kilimanjaro yarn from Miss Babs . 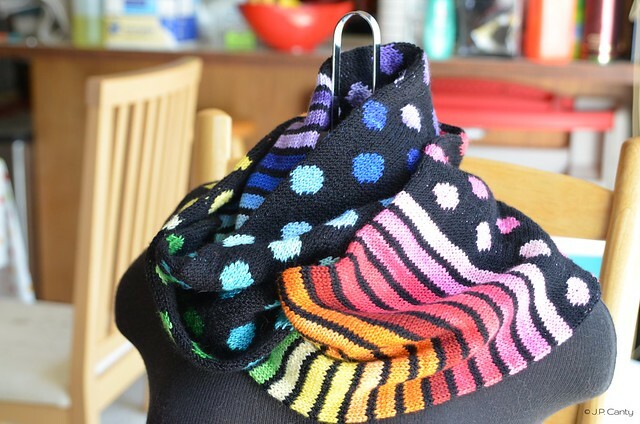 Jasmin is making amazing progress on her Rainbow Dots cowl out of Canon Hand Dyes mini skeins . 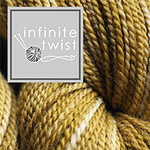 Jasmin mentions watching the Lucy Neatby DVD s in preparation of the Infinite Twist Octopus kit that we want to knit. She recommends the jogless join on the Techknitter blog. She mentions her Jane Austen cowl. Gigi finished a pair of tube socks out of Opal van Gogh for Genevieve. Jasmin is also working on another cowl, the Three Color Cashmere cowl by Joji Locatelli out of Pepperberry Knits cashmere. Gigi is working on the Fractal Danger shawl by Martina Behm, #behmalong out of Abstract Fiber Supersock + in the Danger colorway, which was part of the House Special by the Barmaids. She is also knitting another pair of Gansey socks, out of Invictus Yarns, in the Beyond Grey Flannel Colorway on size 1 Karbonz needles. We are currently working with these needles for a future review. We mourn the passing of Lisa Grossman, the Tsock Tsarina. The knitting community has suffered a great loss. We attended the yarn swap at Purlescence, and Gigi came home with lots of sock yarn bits for preeemie hats. And Jasmin is thrilled with the effects of the Gleener . We mention meet-ups organized by Sasha Torres from Sheepspot, and Shilo of Spincontrol, for aficionados of Jenkins drop spindles. We were listening to Fluffy Fibers podcast and theYarns from the Yinhoo podcast during KIP day. This weeks prize is a skein of Invictus Yarns in the Unafraid colorway, in the Torrent base. 75% superwash merino, 20% nylon and 5% stellina. 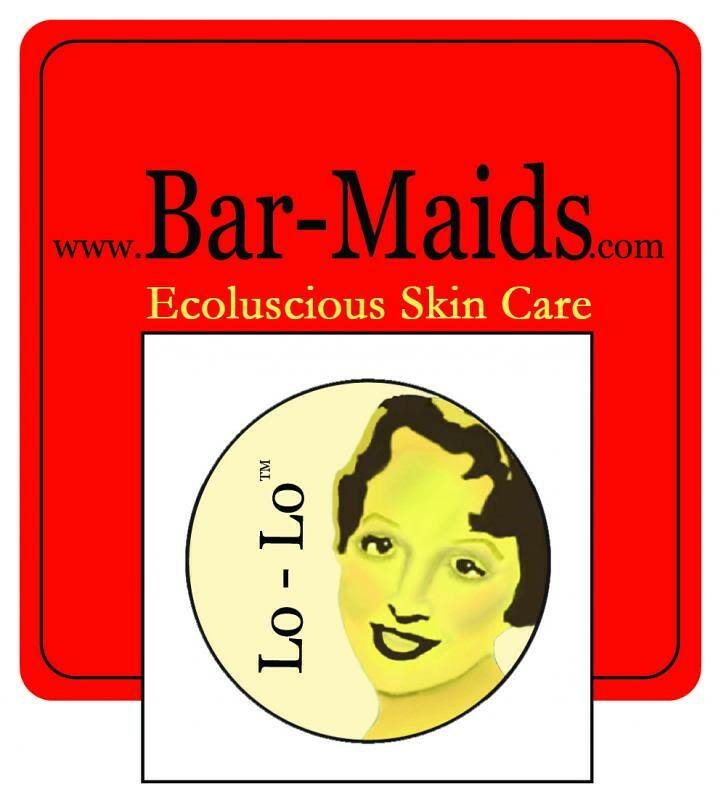 Projects will be judged on originality and general delightfullness. about pattern ideas for gradient yarn. Miss Babs's kits are amazing, as are Martina Behm's kits. Also, a lot of Stephen West's patterns will work spectacularly for gradient yarns. Moebius cowl, and Jasmin mentions Amy Detjen's sweater out of Knitcircus, and the Hiro cardigan. We are wondering if there is a filter for gradients in ravelry. The Philosopher's Fair Isle is an option for gradients, as is using Kauni, like Stephanie Pearl McPhee's project. Or the Lane Splitter skirt. The other question we try to answer is what to do if you get gauge but hate the fabric. Custom Fit software by Amy Herzog. We don't know if you can import patterns into this software. Jasmin's Cocoknits Katarina is mentioned. Gigi was attacked by a variation of the provisional crocheted cast-on. She got the wrong amount of stitches on the Fractal Danger Shawl. Week 3 and Week 4 of Tour de Fleece training. Jasmin is trying Corriedale from a new to her breeder. She mentions Amy King's article about how to reduce pilling. Have you seen the limited edition Cashmere at Webs? http://www.yarn.com/.../loro-piana-416-cashmere-hand.../ 198 yds for $29.99?